It was a different time and a different era. People were kind and always had a “hello” for each other. Thinking back, he was just a boy who thought that he was a man when he marched off to Army boot camp. Like most in his platoon, he was eager to march off to war to become a hero like so many before. War changes a person. He spent three years in the Pacific, in places he had never even heard of. Most of the time he was fighting for his life, it was him or the enemy and the enemy was not going to win. All of it changed him. When he returned home he packed everything up and neatly placed it in a cedar chest. It was as if that chest was his foot locker, like the one he had stored his meager belongings in while in the Army. As he places the last items, his uniform, in the chest – he comes across his Army hat. Memories flood back of his first days of boot camp. His first formation, meeting his fellow soldiers, Army grub and more… How he misses his buddy Bob. They hit it off right from the start. The things they did together and the stories that they shared are all memories of a time gone by. He can not put his Army hat away. As he holds it within his callused hands, he can not force himself to pack it away with all of the other mementos of his days in the Army. It’s his life blood, his token, the one thing that will always remind him of his days in the military. Within its folds, lie the memories of his Army buddies. He was one of seven of forty-four men in his platoon that returned home. For many called him a hero, but in his eyes the real heroes never made it back. As time marches on, he still holds dearly to the memories of his fellow soldiers. He never packed that Army hat away. In fact, he wore it every day he left the house. The neighbors once called him a hero, now they just look at him like his is some old crazy man. But he doesn’t care. The memories of the faces of the brave men whom he served along side come rushing to his mind’s eye as he grabs that old Army hat and proudly places it upon his head as he leaves his house for the day. Years pass. He marries and has a few children. Not one day goes by that he does not reach for that old Army hat as he walks out the door. The stories it could tell are stories that he will never share. Deep in his soul he lives those stories over and over as he places that Army hat upon his head. Just two good friends sitting and talking, that is all they are. With a cup of coffee in one hand and a Danish sitting on a plate near by, one man proceeds to tell his friend about his father and his old Army hat. What was a story about a friend’s father has now become a powerful song and video that many can relate too. As much as the story about the soldier who continues to wear his old Army hat is quite entertaining, it’s the tale end of the song and story that softens even the hardest of hearts. “The story of the little boy coming up and wanting his picture when they got to the Memorial, that actually happened. That’s a true story.” shares Bill. A great song writer will always write a song that can paint an image within the listener’s mind while they hear the song. This song, with it’s up beat melody does just that. However, it truly captures the listener when it speaks about the actions that this man took with the little boy that brings a sense of honor to one’s soul as you hear it. The hero in Bill’s song served in the Pacific theater, during World War II. “The soldier - this man - he was in the south Pacific.” shares Bill. “I’ve seen pictures of him and his unit. They were on the front line in the Pacific. For those of us who weren’t there, we couldn’t imagine it I’m sure. 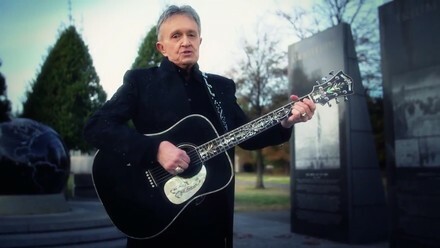 Bill Anderson includes this powerful song on his latest album called Life. The album features ten beautifully written and recorded songs that capture essence of many aspects of the title. The album opens with a fun song called “Bubba Garcia’s.” Performed in a Tex-mex feel, Bill gains the help from Willie Nelson in this fun filled song. The album continues with the first of many songs that will hit our list of Top Songs of 2014, while earning a nomination for the Spirit Award’s Song of The Year Award. John Anderson lends his vocal talents in “Rhinestone Grindstone.” Performed as gentle ballad, this one captures the life of a country music entertainer who’s career is fading in to the history books. The second song to hit our list from this album is “Blackberry Winter.” This beautiful ballad contains a lot of artistic definition in the instrumentals mixed with a lot of imagery while it paints a picture of living through tough times in a relationship. Another song that we pulled from this album to hit our list is “When You Love Me.” Bill utilizes the beauty of an acoustic piano mixed with a gentle string arrangement as the back drop in this beautiful love ballad. As artistically defined as the instrumentation is, it’s the power of the message contained within the lyrics performed with Bill’s unique whispering vocals that draws this song out demanding for anyone to take a listen to. The message is that of love between two people and the love between one’s self and God. This song will also make for a beautiful addition to any wedding ceremony or to dedicate to anyone who is special in your life. Although Bill has written and worked with so many entertainers throughout his career, there is one that eluded him. “Well obviously being the age that I am and the generation that I am, I would have loved to have sat down in a dressing room at the Opry backstage with Hank Williams and had a guitar and written a song together.” humbly replies Bill. “That would have been my ultimate fantasy, I guess. To write a song with him. You’re right, I’ve never met Hank Williams. It’s very rare that we acknowledge an album by nominating it for the Spirit Award’s Album of The Year Award. However, I must say this one deserves such an honor. Not because of Bill’s legendary status. It’s the arrangement of the instrumentals, the heart of the lyrics that create an image in the listener’s mind and the pure heart and soul of Bill’s raw emotions is what makes this album so incredible. But what is more incredible is that this album captures life in general. It consists of comedy, heart break, work, dreams, broken dreams, relationships, love, honor and respect. 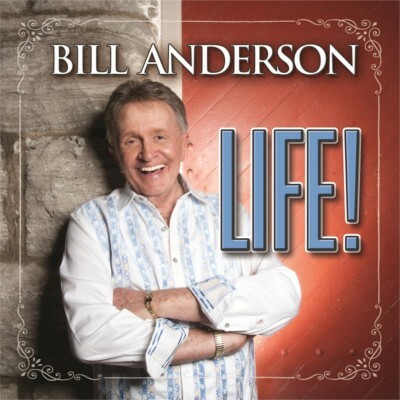 Like the man who shares his “Old Army Hat” to a little boy, Bill Anderson shares his take on Life. Share this one with everyone, for this is what Life is truly about.